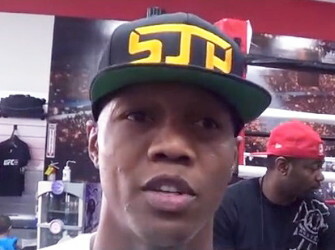 By Jim Dower: 37-year-old former two division world champion Zab Judah (42-9, 29 KOs) will be returning from a two year absence from the ring to face 31-year-old Colombian journeyman Hevinson Herrera (18-11-1, 12 KOs) in a scheduled 10 round bout on September 10th at The Space at Westbury, in Westbury, New York. Judah is trying to resurrect his career, but it’s going to be awfully hard for him to do that. The once great Judah has lost 3 out of his last 4 fights before he stopped fighting in 2013 following a one-sided 12 round decision loss to Paulie Malignaggi. In coming back two years later, it’s unlikely that Judah’s skills have improved. If anything, Judah’s skills have further eroded from disuse and the negative effects of age. Judah looked really bad in his loss to Malignaggi. He couldn’t pull the trigger on his shots even with Malignaggi standing directly in front of him. Judah looked like the classic definition of a shot fighter. Whether that was because of what Malignaggi was doing or a case of Judah really being shot is unclear. My guess is Judah looked so bad because he no longer has it. Judah’s opponent is in worse shape them him in having lose 7 of his last 11 fights. Herrera has never had a real prime, and never done anything with his career in terms of beating high caliber opposition. Herrera clearly doesn’t belong in the same ring with a fighter like Judah, even a 37-year-old version. I’m sure Judah has got to feel a little confident that he can make something happen with his career after seeing the likes of Andre Berto getting a nice money payday against WBA/WBC welterweight champion Floyd Mayweather Jr. on September 12th in Las Vegas, Nevada. If Judah is thinking the same fairytale story can happen to him then he’s kidding himself. Mayweather isn’t going to fight anyone like Judah given his poor record in the last five years of his career. If Judah can move down in weight perhaps to the lightweight division, he might be able to have a little luck in beat some guys. The problem is Judah likely can make weight for the 135lb division. He’s going to be stuck fighting guys at 140, and those fighters are too good for him at this point in his career. Judah should have stayed at 140 earlier in his career instead of moving up in weight. But the money that Judah got in fights against Floyd Mayweather Jr., Miguel Cotto, and Carlos Baldomir was obviously too good for him to resist fighting at 147. The last time Judah looked good was in his 9th round stoppage win over Vernon Paris three years ago in 2012. Judah looked real good in that fight, but then again he was in against a guy that had no business fighting a world class fighter. It was the perfect opponent for Judah, so of course he looked good against the level of opposition he was facing. But it’s a much different story than if Judah were asked to do the same thing against a talented fighter.